Look around the room you're in right now. Chances are you see technology that has only been around for a short time. You may be reading this on a tablet or smartphone that is less than two years old. And while your phone calls may not sound much different than they did decades ago on a landline, the technology behind it all has been rapidly evolving. And with developments such as 4G and ubiquitous Wi-Fi setting the stage, we’re rapidly approaching the next iteration of voice. The past several years have seen the development of underlying technologies that stand to redefine telecommunications, and in 2015 some of these innovations will begin to bear fruit. Here are a few key developments to look for in 2015 that will have a profound impact on the telco industry. It starts with the next phase of something that has been around for more than a decade. By now we’re familiar with the cloud and how it can benefit us as consumers and as businesses by increasing flexibility in a variety of ways. Internet companies, for example, have the agility within their infrastructure to rapidly develop and deploy new services to attract customers and generate revenue. Up to this point, we have not seen this within the telco industry. Now, however, operators are taking the next big step by actually deploying commercial clouds within their infrastructure that will be responsible for providing traditional network services and delivering new innovative services to customers. Cloud-based infrastructure will provide major benefits when it comes to flexibility in the product development cycle. Rather than develop a product and slowly integrate it into a legacy infrastructure with lengthy testing, operators will enjoy a much shorter innovation cycle, and the freedom to rapidly adopt new ideas – and discard those that prove untenable. The result for operators is increased capacity and new opportunities to generate revenue. For customers, the benefit is greater choices when it comes to the services and providers they use. But it’s also something more fundamental – simply better communication. With LTE now available all over the world and the almost ubiquitous availability of Wi-Fi, the path has been cleared for two major developments in the way voice services are delivered and consumed. One of these is Voice over LTE (VoLTE). We have seen the first deployments of this in 2014, and it will become more mainstream in the coming year as more providers roll it out to customers. VoLTE is a transformational technology that brings voice communications into the 21st century. Anyone who has ever had to say “D as in Delta” during a phone call knows the limits of clarity, as traditional networks limit the audio frequencies that are transmitted in order to save bandwidth. VoLTE, however, provides true high-definition audio that delivers the full spectrum of sound to the user for crystal-clear communications to greatly improve the user experience. Not only does this benefit the customer, but telco operators experience dramatically improved efficiency in the use of the network. As one of the first services based on cloud technology to be deployed, VoLTE delivers 15 times the efficiency of traditional network architecture, allowing call volumes to expand while reducing total bandwidth demands. This frees up more resources for carrying data, which is still seeing an explosion in demand. And the provider that can deliver such improved service to customers is likely to be rewarded with improved customer loyalty. The innovation will continue in 2015 with the rise of Voice over Wi-Fi (VoWifi). Like VoLTE, VoWifi takes advantage of improved network infrastructure for new means of providing voice service – in this case, extending the use of Wi-Fi to complement 4G networks. With cell towers being outdoors and potentially far from the user, some wireless customers suffer from poor indoor reception. But while their 3G or 4G connection might be weak, wireless networks have popped up nearly everywhere. VoWifi takes advantage of this ubiquity by delivering seamless voice communications over the wireless network to complement the provider’s network. With cell and Wi-Fi coverage working together, poor signal strength becomes a thing of the past. VoWifi also means that by connecting to Wi-Fi when it’s available, the customer can make local calls without worrying about roaming charges. And with better service, tools that have suffered from poor performance – such as video calling – become true communication tools that can be used anywhere. The end result – operators providing better service and customers enjoying more productive communications. The innovations coming to service providers and customers in 2015 all begin with significant network improvements that break through the impediments to innovation, yielding new services including VoLTE and VoWifi. And as operators’ infrastructure becomes more powerful and dynamic, watch as more tools are developed to increase the power of communication. 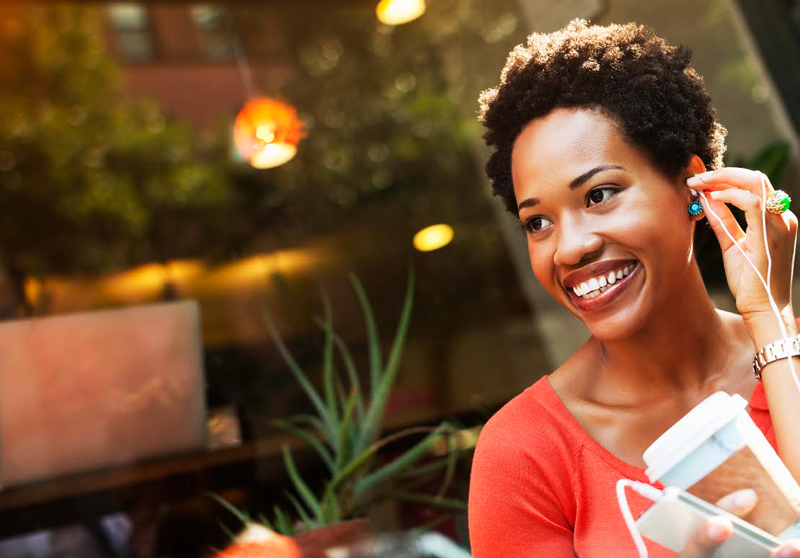 The future of voice communication is bright – watch as it all begins unfolding in 2015. Phil is VP of Networks Portfolio Marketing for Nokia, covering forthcoming technologies, radio and core infrastructure for GSM, WCDMA, FDD-LTE and TD-LTE, as well packet core, subscriber data management, packet networks, industry-leading OSS and Customer Experience Management software and the full suite of Global Services including network planning and optimization services, system integration, implementation, care and managed services. Phil has been active in the telecoms industry since 1984 and has extensive experience working with operators to implement innovative solutions and achieve business success. In his earlier positions at Nokia Siemens Networks and Nokia Networks, which he joined in 1999, he was global Sales Director for Vodafone, head of the Customer Team responsible for Hutchison's business in the UK, and head of a Business Development team. Phil has a Masters degree in Electrical Sciences from Cambridge University and an MBA. He is married, has three daughters and lives in Hampshire, UK. ZTE updated its financial guidance, saying it now expects net profit attributable to shareholders to be RMB 2.64 billion (US$424 million) in 2014, compared with RMB 1.36 billion a year earlier, according to preliminary unaudited results. Full-year revenue is forecast to be RMB 81.24 billion, 8% higher than in 2013. ZTE posted growth in its 4G TD-LTE and FDD-LTE systems business in China, as well as its 3G and 4G smartphone operations internationally. AT&T completed its previously announced acquisition of Iusacell, a leading Mexican mobile operator, from Grupo Salinas for US$2.5 billion, inclusive of Iusacell debt. The deal includes all of Iusacell’s wireless properties, including licenses, network assets, retail stores and approximately 8.6 million subscribers. 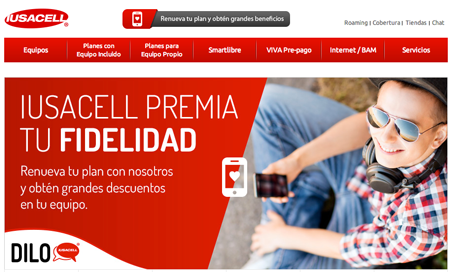 Iusacell offers wireless service under both the Iusacell and Unefón brand names with a network that today covers about 70 percent of Mexico’s approximately 120 million people. AT&T plans to expand Iusacell’s network to cover millions of additional consumers and businesses in Mexico. Iusacell operates a 3G GSM/UMTS network based on the same technology that AT&T uses in the United States. Iusacell owns between 20 and 25 MHz of 800 MHz spectrum, primarily in the southern half of the country, including Mexico City and Guadalajara, and an average of 39MHz of PCS spectrum nationwide. Iusacell will continue to be headquartered in Mexico City. F. Thaddeus Arroyo, a 19-year AT&T executive, has been named to lead Iusacell as its Chief Executive Officer. Telstra launched new 100G Wavelength services across multiple ultra-long haul submarine cable routes globally. These cables reach Japan, Hong Kong, Taiwan, Korea, Australia and the United States. 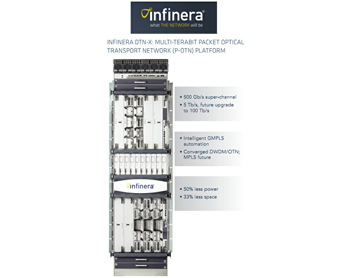 Infinera announced the deployment of its DTN-X platform across Middle East and North Africa (MENA) Submarine Cable System's trans-Egypt terrestrial network. The installation will allow MENA to provide wholesale carriers with a range of connectivity services from STM-1 to 100 Gbps and terabit capacity. MENA, a subsidiary of Orascom Telecom Media and Technology, owns and operates a submarine telecommunications system connecting Europe to the Middle East and Southeast Asia. 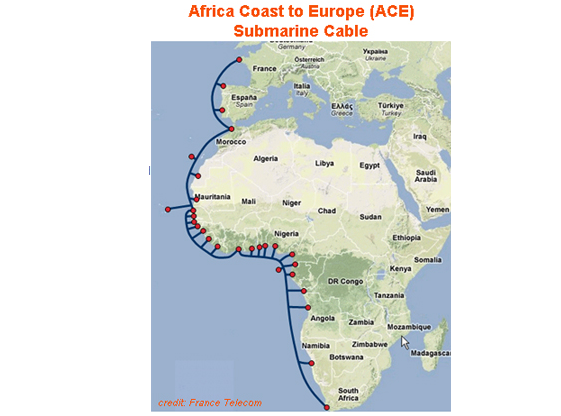 Alcatel-Lucent has tested 300 Gbps and 400 Gbps transmission technology on the Africa Coast to Europe (ACE) submarine cable system, which connects France to the west coast of Africa. The tests achieved 12.6 terabits-per-second (Tbps) per fiber pair using the Alcatel-Lucent 1620 Light Manager submarine line terminal using optical coherent technology. Alcatel-Lucent said the field trial demonstrated more than a fivefold increase in the system’s initial design capability, setting a new record for capacity upgrades. Ultimate capacity upgrade is optimized through different wavelength bit rate for regional (400G) and transoceanic (300G) distances. Telstra is launching a Global Media Switch that allows broadcasters and content creators to schedule, manage and distribute video in real-time across the world. The IP-based professional video delivery platform provides customers with codec-level connectivity directly from the originating content source all the way to the broadcast destination. Global Media Switch can also be combined with Telstra's Satellite Media Services. Jim Clarke, Director of Marketing, Products and Pricing, Telstra Global Enterprise & Services, said Global Media Switch accommodates the significant transformation that the media landscape is experiencing, by offering greater control over media assets and 'Codecs as a Service' through a zero-capex pricing model. "With new models of on-demand consumption and audience fragmentation, media companies have had to make some substantial changes to the way they acquire, distribute and manage media assets. In this new era, staying profitable requires fresh thinking and adaptive approaches to technology. With the Global Media Switch web portal, video contributors can take direct control of service booking, scheduling and delivery to broadcasters themselves in a cost effective way, and even advertise content to other media providers to further maximise revenues." In 2014, Telstra acquired Ooyala, a Silicon Valley-based provider of video streaming and analytics. Under the deal, Telstra will pay US$270 million to increase its ownership in Ooyala from 23% (fully diluted) to 98%. Telstra had previously invested US$61 million in Ooyala over the past two years. Ooyala harnesses the power of big data to help broadcasters, operators and media companies build more engaged audiences and monetize video with personalized, interactive experiences for every screen. The analytics helps determine exactly which content should be presented to individual views. The streaming platform provides content management tools, fast transcoding and adaptive bit rate delivery to customized players. The company, which was founded in 2007 and is based in Mountain View, California, is forecasting revenue of US$65m for CY2014. The company has more than 330 employees worldwide and a global footprint of 135 million unique users in nearly 240 countries. Its customers include Telstra, ESPN, Univision, Telegraph Media Group, Dell, Sephora, Foxtel, NBC Universal, Comedy Central, News Corp and The Washington Post. 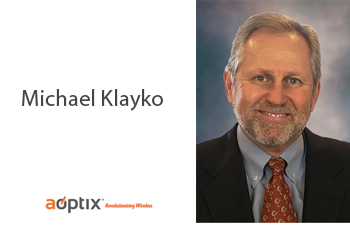 AOptix Technologies,which specializes in ultra-high capacity wireless communications based on Composite Optical-RF (COR™) technology, named Michael Klayko as its new CEO. Klayko is the former CEO of Brocade Communications Systems from 2005 to 2013, a period in which the company's revenues grew fourfold to $2.3 billion. Prior to Brocade, Klayko was the CEO of Rhapsody Networks, which was acquired by Brocade in 2003. He previously held leadership positions at leading technology companies including McDATA Corporation, EMC Corporation, Hewlett Packard and IBM. He currently serves on the board of directors at PMC Sierra and Allscripts. In addition, AOptix has received an additional growth round of funding to capitalize on the global opportunity for its breakthrough AOptix Intellimax wireless backhaul technology. Etisalat will deploy Alcatel-Lucent's virtualized radio network controller in its access network in both the United Arab Emirates and Sri Lanka. Under Etisalat’s network modernization program, Alcatel-Lucent is initially deploying the 9771 Wireless Cloud Element Radio Network Controller (WCE) in Etisalat’s network in the UAE, following in Sri Lanka during 2015. Etisalat has already deployed the WCE platform in Mobily’s Saudi Arabia network. In addition to the virtual Radio Network Controller, Alcatel-Lucent has already announced virtualization of a wide range of network functions, including evolved packet core (vEPC), IMS (vIMS), service routing (VSR) and Content Delivery Network (vCDN). Zayo will deploy fiber to the EdgeConneX data centers across the U.S. Under the deal, Zayo will build diverse entrances into six Edge Data Centers and provide diverse entrances to two additional facilities. Zayo fiber will become available to Edge Data Center customers in Atlanta, Las Vegas, Memphis, Nashville, Portland, Richmond, Salt Lake City and San Diego. These new markets will join both the Houston and Phoenix Edge Data Centers, which already offer Zayo connectivity. Customers can access pricing and place orders for connectivity to all of these Edge Data Centers through Tranzact, Zayo’s innovative shopping platform. EdgeConneX specializes in providing purpose-built, power dense and edge of network Edge Data Centers and wireless solutions.